Looking for crochet inspiration? 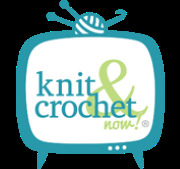 Sign up for our FREE Talking Crochet newsletter! It's delivered to your inbox every two weeks and is filled with must-have crochet news, useful tips, interesting techniques, product reviews and more. Plus, every issue includes a FREE crochet pattern download! Visit the Crochet! magazine Facebook page every Wednesday in March to download the free weekly accessory pattern! Go here to be a part of the Crochet! Facebook family. To view or download the weekly patterns, you will need Adobe® Reader®. This Roses & Lace Scarf is this week's featured pattern. Basic stitches combined with a few dazzling flourishes give high-fashion style to this gorgeous hot pink scarf that may be worn different ways for a variety of chic looks. Stitch the Roses & Lace Scarf in Plymouth Encore Worsted in Bright Fuschia. A Reverse Single Crochet how-to video will guide you as you work on this project. This Cape Cod Hand Warmers set is this week's featured pattern. Classy, denim tweed yarn gives cool style and cozy warmth to these fun, flirty hand warmers. Stitch the Cape Cod Hand Warmers in Plymouth Encore Tweed in Denim. A How to Crochet in the Back Loop video will guide you as you work on this project. 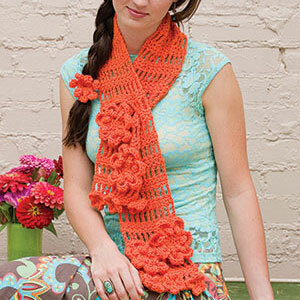 This Orange Blossoms Scarf is this week's featured pattern. This versatile scarf will become a year-round favorite. Stitch the Orange Blossoms Scarf in Plymouth Encore Worsted in Neon Orange. A How to Treble Crochet video will guide you as you work on this project. This Rolling Waves Motif Shawl is this week's featured pattern. This uniquely-designed wave motifs and chevron-style panels come together in a striking pattern of crochet symmetry. Stitch the Rolling Waves Motif Shawl in Plymouth Encore DK in Dark Lavender, Bubblegum and Light Pink. A Half Double Crochet Decrease video will guide you as you work on this project.